Not to be confused with The Commerce Journal. The Journal of Commerce is a biweekly magazine published in the United States that focuses on global trade topics. First published in 1827 in New York, the Journal has a circulation of approximately 15,000. It provides editorial content to manage day-to-day international logistics and shipping need, covering the areas of cargo and freight transportation, export and import, global transport logistics and trade, international supply chain management and U.S. custom regulations. In 1827, Arthur Tappan and Samuel Morse decided that New York needed another newspaper. The Journal of Commerce operated two deepwater schooners to intercept incoming vessels and get stories ahead of the competition. Following Morse's invention of the telegraph, the JoC was a founding member of the Associated Press, now the world's largest news-gathering organization. Publications in the 19th century took positions on political issues and were rarely concerned with being impartial. The JoC weighed in on the biggest issue of the day — slavery. Gerard Hallock and David Hale, partners in the JoC, were opponents of slavery but also critics of the abolitionists, and they decried the tactics of the war wing of the Republican Party. After the American Civil War broke out in 1861, the postmaster general suspended the paper's mail privileges, effectively interrupting its publication, on grounds of "disloyalty." Hallock challenged this decision but failed to have it overturned. With its evening edition suspended and the morning edition distributed only to non-postal subscribers, editor Gerard Hallock stepped down on August 31, 1861. David M Stone, head of the commercial news department, and William Cowper, took over his interest in the Journal. Three years later, President Abraham Lincoln ordered the JoC closed after it was among New York papers victimized by a bogus story quoting the president as calling for 400,000 more volunteers. Following the Civil War, David Stone and William C. Prime, a lawyer who invested part of his fortune in the paper converted the paper from a partnership into a corporation. Prime soon retired to become president of the Metropolitan Museum of Art. Though continuing as one of the lead investors, Prime left Stone in sole control. Stone devoted himself to the paper, writing most of the editorials and many of the page one stories. But he neglected the paper's physical plant, allowing its technology to become outdated. Type was still set by hand in an era when most papers had switched over to linotype machines. The paper lost ground to its competitors, including the Daily Commercial Bulletin, founded in 1865 and owned by William Dodsworth, a friend of Stone's. But unlike his friend, Dodsworth believed it was more important to invest earnings in plant and equipment than to pay it out to investors. In 1893, Prime and Stone agreed to sell the JoC to Dodsworth and merge it with the Commercial Bulletin. Though Dodsworth was the acquirer, he retained the JoC's name. The new paper became The Journal of Commerce and Commercial Bulletin, a name that was to be maintained through the 1990s. The merged paper benefited enormously from the Commercial's new presses and linotype machines, each of which could replace three or four men setting type by hand, one letter at a time. The papers also had complementary advertising support. The Commercial drew advertising from the grocery and provisions business, from insurance and banking. The JoC's coverage focused on shipping and chemicals, textiles and insurance. When Dodsworth took over, he immediately laid off most members of both staffs. He didn't want writers who couldn't write on the newfangled typewriting machines or compositors who couldn't run linotypes. After the 1907 panic, a young editor at The Journal of Commerce, H. Parker Willis, became a leader in the drive to establish a Central Bank. He teamed up with Carter Glass, the Virginia senator, to write the Federal Reserve Act. Much of the work was done in the offices of the JoC. Throughout its history, the JoC maintained a different perspective on the news. Coverage of major events, such as the San Francisco earthquake of 1906 and the U.S. entry into World War I, emphasized the effect on business. During World War II, the JoC reprinted and indexed the wartime regulations that controlled production and supplies. The JoC's profits boomed during World War I with a sharp increase in advertising and circulation related to the wartime industrial expansion. The growth continued into the early 1920s. Then in 1921, the Dodsworths sold the paper to William C. Reick, who acquired it with money put up by Charles A. Stoneham, the wealthy owner of racehorses and the New York Giants. After Reick died in 1924, Stoneham appointed a new front man, Raphael Govin, who pushed the JoC into more sports coverage. Willis, who had become editor-in-chief of the JoC in 1919, watched with alarm as the paper's profits began to dwindle, when everyone else in the Roaring Twenties was making money. After Govin died and the JoC appeared to be on the verge of extinction, the paper was purchased in 1927 by the three Ridder brothers: Bernard H., Joseph E. and Victor F. They were the sons of Herman Ridder, the publisher of the German-language Staats Zeitung, the New York Herald and the Long Island Press. The outbreak of World War II dramatically affected financial and commodity markets. The Ridder brothers soon built a newspaper empire of their own. They sold the JoC's AP franchise, which was a valuable asset in a day when access to the AP wires was restricted to franchise-holders. This enabled them to buy the St. Paul Pioneer Press-Dispatch. Bernard H. Ridder became publisher of the Pioneer Press-Dispatch, turning the JoC presidency over to Joseph E. Ridder. In the postwar years, the JoC also earned a reputation as a prime source of international trade news. In 1973 the paper scooped the world on perhaps the most significant economic development of the last 30 years. Six days ahead of any other newspaper, the JoC reported that Arab nations were going to embargo oil shipments to the U.S.
On Saturday, October 20, 1973, as the Yom Kippur War raged, the world learned that Arab nations would be suspending the supply of oil to the United States. The Journal of Commerce had the story of the notorious Arab oil embargo more than a week earlier. "It was a story that impacted the entire world", said Harold Gold, who was editor of the JoC at the time. Few thought the Arab nations would use oil as a weapon against the U.S. in response to its military support for Israel, which included a $2.2 billion military aid package. There had been threats, and an attempted embargo in 1967 that failed, so most dismissed the idea that it would ever happen. In the later part of the 20th century, the JoC intensified its coverage of shipping, earning its nickname as the Bible of the maritime industry. Shipping was transformed forever by the introduction by Malcom McLean in 1956 of the container ship. Containerized shipping made traditional breakbulk ports obsolete and provided the means for Asia's export boom, which changed the world's economic map. The JoC reported in detail on these and other developments in transportation and logistics. The JoC never missed a day of publication, even on the day in February 1993, when terrorists detonated a bomb in the garage under the World Trade Center, killing six people. The paper's New York staff managed to find its way down the darkened, smoke-filled fire-escape stairs of the tower to safety below. The staff at the Phillipsburg, New Jersey printing plant put the paper out that day. The shipping industry, which had flourished through the 1960s and 1970s, began a period of consolidation in the mid-1990s because of plunging freight rates. Separate shipping companies that had run multiple ads in the paper merged and eliminated competing routes. With the rapid growth of the Internet in the 1990s, many shipping companies began to switch their ship schedules onto their Web sites, where shippers around the world could access them. Knight-Ridder decided to get out of business information altogether to focus on its daily metropolitan newspapers. In 1995, it sold the JoC to The Economist Group of London, publishers of the widely respected, The Economist. Under The Economist Group the JoC tightened its focus to cover international trade logistics. 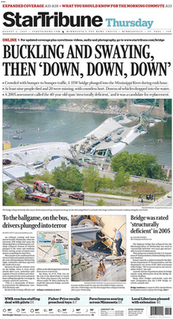 In 1999, the broadsheet newspaper was converted to a tabloid newspaper format. It became increasingly apparent that a print newspaper with a worldwide readership faced a struggle in keeping its readers up-to-date on breaking news. By the time the newspaper was delivered, most readers had already gotten their news by fax, telephone or on the Internet. In 2000, the JoC converted the its daily print publication into a weekly magazine, JoC Week, which provided analysis of trade logistics. In 2001, The Economist sold the JoC to Commonwealth Business Media, the New Jersey-based publisher of Pacific Shipper, Canadian Sailings, and a number of railroad and trucking directories. The new owners had long-standing connections with the transportation industry, having previously owned Traffic World, another magazine acquired with its purchase of the JoC Group. In 2006, United Business Media acquired Commonwealth Business Media, from its owners: RFE Investment Partners, Bariston Partners, The Economist Group, ABRY Partners and Commonwealth's management. In 2008, United Business Media reorganized Commonwealth Business Media into two separate market-focused businesses. The Journal of Commerce became a part of the UBM Global Trade group, focusing on serving professional communities engaged in commercial sea, rail and road transportation and logistics worldwide. Effective March 2, 2009, Traffic World magazine and The Journal of Commerce merged into one publication under the flagship Journal of Commerce banner. The JoC introduced a redesigned, comprehensive editorial product that utilizes data from PIERS: The Port Import/Export Reporting Service to enhance news stories, offer a variety of Web tools that will complement its move to a digital environment with real-time focus, provide more analysis and market-oriented content. The combined publication integrates the trucking, rail transport, express and domestic-focused logistics coverage of Traffic World with the international, U.S. Customs, container shipping, intermodal and breakbulk focus of The Journal of Commerce titles. The new publication is led by Paul Page, Editorial Director, and Joe Bonney, Executive Editor. UBM sold the majority of its data business to Electra Partners in 2013, who formed AXIO Data Group. IHS Inc. announced in November 2014 that it had signed a definitive agreement to acquire JOC Group Inc.
^ "New York Journal of Commerce". ^ IHS "IHS Announces Agreement to Acquire JOC Group, the World's Leading Supplier of U.S. Seaborne Import and Export Trade Data"
Joc Sailings, sailing schedules and regional news. The Financial Times (FT) is an English-language international daily newspaper owned by Nikkei Inc, headquartered in London, with a special emphasis on business and economic news. The Star Tribune is the largest newspaper in Minnesota. It originated as the Minneapolis Tribune in 1867 and the competing Minneapolis Daily Star in 1920. During the 1930s and 1940s Minneapolis's competing newspapers were consolidated, with the Tribune published in the morning and the Star in the evening. They merged in 1982, creating the Star Tribune. After a tumultuous period in which the newspaper was sold and re-sold and filed for bankruptcy protection in 2009, it was purchased by local businessman Glen Taylor in 2014. The Mercury News is a morning daily newspaper published in San Jose, California, the largest city in Silicon Valley. It is published by the Bay Area News Group, a subsidiary of Digital First Media. As of March 2013, it was the fifth largest daily newspaper in the United States, with a daily circulation of 611,194. As of 2018, the paper has a circulation of 324,500 daily and 415,200 on Sundays. Neptune Orient Lines Limited (NOL) is a Singapore-based global container shipping company with about 6,000 staff across over 80 countries. The company is a wholly owned subsidiary of the CMA CGM Group. UBM plc is a global business-to-business (B2B) events organiser headquartered in London, United Kingdom. It has a long history as a multinational media company. Its current main focus is on B2B events, but its principal operations have included live media and business-to-business communications, marketing services and data provision, and it principally serves the technology, healthcare, trade and transport, ingredients and fashion industries. UBM was listed on the London Stock Exchange and was a constituent of the FTSE 250 Index until it was acquired by Informa in June 2018. China Shipping Container Lines Co., Ltd, was a containerized marine shipping company, based in Shanghai, China. The Official Guide of the Railways, now known as the Official Railway Guide, was originally produced by National Railway Publication Company of New York City, beginning in 1868. The modern Official Railway Guide provides routing and shipping information for freight on United States railroads and is now published by the RailResource division of JOC. Kuehne + Nagel International AG is a global transport and logistics company based in Schindellegi, Switzerland. It was founded in 1890, in Bremen, Germany, by August Kühne and Friedrich Nagel. It provides sea freight and airfreight forwarding, contract logistics, and overland businesses with a focus on providing IT-based logistics solutions. In 2010, Kuehne + Nagel was the leading global freight forwarder, accounting for nearly 15% of the world's air and sea freight business by revenue, ahead of DHL Global Forwarding, DB Schenker Logistics, and Panalpina. As of 2017, it has more than 1,336 offices in 109 countries, with around 82,000 employees. Informa plc is a multinational events and publishing company with its head office and registered office in London. It has offices in 43 countries and around 11,000 employees. It owns numerous brands including CRC Press, Datamonitor, Fan Expo, Institute for International Research, Lloyd's List, Penton, Routledge, Taylor & Francis, and UBM. The Daily Journal of Commerce (DJC) is a U.S. newspaper published Monday, Wednesday and Friday in Portland, Oregon. It features business, construction, real estate, legal news and public notices. It is a member of American Court & Commercial Newspapers Inc., and the CCN News Service, National Newspaper Association, International Newspaper Promotion Association, Oregon Newspaper Publishers Association, The Associated General Contractors of America, Oregon-Columbia chapter, and Associated Builders and Contractors Inc. DJC is owned by BridgeTower Media. The Saguache Crescent is a weekly newspaper published in Saguache, Colorado, notable for continuing to use linotype long after most newspapers have adopted more modern production methods. The Sylvester Local News is a historic newspaper company in Sylvester, Worth County, Georgia. It is the oldest business in Worth County. The paper's brick building was constructed in the 1920s was individually listed on the National Register of Historic Places (NRHP) on August 21, 1980 as the Worth County Local Building. It is located at 118 North Isabella Street. MIQ Logistics is a third party logistics company headquartered in Overland Park, Kansas. Today, MIQ Logistics operates in global freight forwarding, customs brokerage, supply chain management, project logistics, origin consolidation, global trade management, warehouse management, and global business intelligence. With offices in North America, Asia, Europe, Africa, Australia, New Zealand, the Middle East, and Latin America.